A day of introspection as results dominate failing to follow Wall Street higher. ASX 200 down 15 to 6064 as CBA goes ex dividend and CSL disappoints the bulls with no upgrade to guidance. CSL and CBA knocked 24 points off the index so not a bad performance. Banks were solid with MQG gaining upgrades following the update yesterday. Iron ore miners saw some profit taking as Asian iron ore fell after its stellar run. Energy stocks pushed ahead on crude rises and airline stocks were in demand as VAH results took off. Good volume today as results continue tomorrow with TLS the focus. AUD firmed slightly to 71.28c. ASX 200 down 15 to 6064 fails to hold gains as CBA goes ex. High 6094 Low 6054. Same range as Tuesday. Strong volume. CBA div knocks 13 points off the index. CSL knocks 11. CSL fails to deliver another upgrade. Royal Commission and housing price falls hurt results. Resources pause for thought, energy stocks better on oil price. Iron ore pauses in Asian trade. MQG +1.36% brokers up targets. AAC +7.03% meat back on the menu. WOR +4.51% oil price rise. MYX +4.32% new drug in US. CGC +3.46% agricultural stocks better. BAP -7.94% shunted into the Autobarn. BPT +5.33% profit guidance raised. CAR -5.42% Stratton Finance takes a RC hit. BLA -5.49% cuts ties with Pension Fund. EXP -20.75% weather related hit as flooding hurts adrenaline adventures. BYE -5.56% low volume opportunity. XIP +20.28% IPH takes a stake. SPT +11.11% finding a base. KGN +4.8+30.43%% tech stocks better. Speculative stock of the day: DomaCom (DCL) – one of Australia’s big four banks is set to launch a 6-month pilot for fractional property investment. Computershare (CPU) +5.90-5.42% First half result was a solid beat. NPAT came in at $192m vs expectations of $169.7m. Revenue and EBITDA beat estimates at $1.15bn and $335.4m respectively. Full year EPS guidance has been upgraded by 12.5% on FY18. A 5% upgrade to guidance is considered very good. We are overweight CPU in both the MT GROWTH and MT TOP 50 portfolios. Carsales (CAR) –5.42% Revenue up 17% to $235m. EBITDA up 8% to $98.0m. Domestic revenue growth of 2% on pcp comprising Private revenues up 12% on pcp, Dealer up 8%, Data, Research, and Services up 6%, Display down 16% and Finance and Related Services down 4%. EBITDA and Adjusted NPAT growth will be moderate in the second half of FY19. the display segment remains challenging, we are anticipating improving performance in the second half. Sky City Entertainment (SKC) -3.96% Reported revenue up 1% to NZ$460.2m. Revenue from ordinary activities up 0.3% to NZ$411.4m Interim dividend NZ10c. Strong financial performance worth normalised EBITDA growth of 10.5%. Buy-back of up to 5% of capital. Outlook expected for around 5% growth in EBITDA in FY19. Economic environment becoming more challenging. Northern Star (NST) +7.47% Revenue of $633.5m up 43%. An interim dividend of 6c fully franked up 33%. Net profit up 4% to $82.1m. On track to meet guidance of 850k-900k oz at AISC of $1125-1225oz. $292m in cash, bullion and investments. GBST (GBT) +17.19% H1 NPAT A$3.7m. FY Guidance: Revenue growth of 5-7% Strong balance sheet with $9.6m in cash. Licence revenue is expected to be 70%, and services revenue 30% of total FY2019 revenue. The net assets of the Group increased by $3.5m during the half-year to $72.3m. GBST has no debt. Bapcor (BAP) –7.94% Revenue $636.1m up 3.2%. Net profit after tax of $43.1m up 6.6%. Dividend of 7.5c. up 7.1%. Record first half of revenue despite challenging markets. Outlook is for FY19 NPAT of 9% above this years. This is the lower end of guidance and may disappoint some. Retail and service segments through Autobarn, Midas and other retail businesses are only 20% of revenue and earnings experienced challenging retail conditions. Tabcorp (TAH) –3.98% Looks like a slight miss on expectations, with NPAT coming in at $210.6m versus an expectation of $214.9m. Revenue was also a slight miss, coming in at $2.79bn vs $2.80bn. The market will probably give the company a pass, given the integration of Tatts Group, which is progressing well. On that front, the company has upgraded its synergy target for FY19 by 10% – from $50m to $55m. CFO Damien Johnston will retire in FY20 after being in the role since 2011. 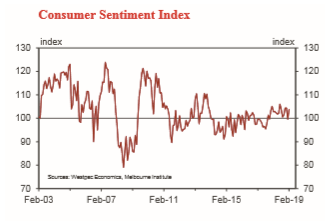 Westpac-Melbourne Institute consumer confidence rose 4.3% in February to 103.8, up from a 4.7% fall the month prior. RBNZ keeps rates on hold again. No rise for 2019 or 2020. Tesla is sending ship loads of Model 3s to China in advance of the trade tariffs increasing. Alibaba has said that it is not being affected too badly by the slowdown in China. Vice Chair Tsai has said “Our business is delinked” from the Chinese economy because “we’re in e-commerce and we’re digitizing the whole sector”. Chinese authorities are winding back some regulations on speculators in the stock market. The Chinese small caps are up 9% in three sessions. China has 148m day traders. A $5.8 trillion equity market. Japanese carmakers have agreed to acquire Ushr, a digital mapping technology company for self-driving cars. South Korean unemployment has risen to a decade high. US and EU close to agreeing on new sanctions on Russia. ‘El Chapo’ guilty. Life sentence awaits. Saudi Arabia is looking overseas for oil and gas opportunities. More than 7m Americans are behind on their car loans. Bank of England head teller Mark Carney has said that Brexit could usher in a new era of democracy and global growth. Chief UK negotiator says back May’s deal or face a long delay to Brexit. They have been warned. 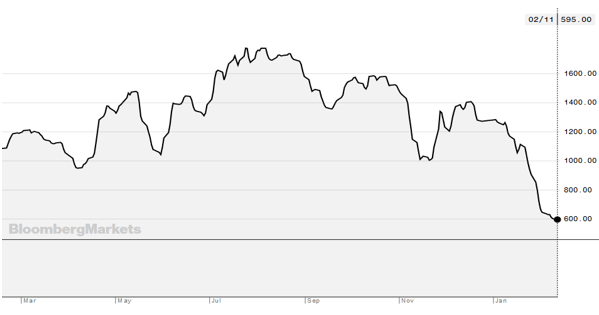 We wrote on this last week, but the Baltic Dry Index is showing serious symptoms of global growth failing. It is down 58% in two months. Two and a half year low.